I figured that I should be safe with posting 3 photos, to avoid my blogger mishap last week. Here are 3 more from prom. At this rate, I'll be posting prom pictures through next year. My best friend Joe was our photographer. I got the completed disc last night with 183 photos on it. I don't think that you'll have to suffer through them all, but I'm sure I'll be posting a lot! 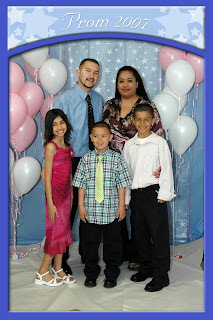 This is my brother Jarod, his ex Montee (Tee) and their kids. Jaiya, Jaice (in front) and Jaiden. I think that this may be their first ever family pic with all 3 kids. Jarod is the music mastermind behind the excellent dance tunes. When I post the candid shots, you have to see how we are all sweating like pigs from being on the dance floor. 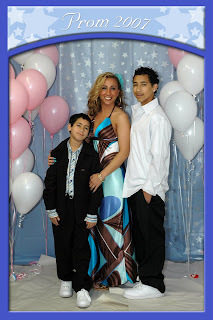 Here is my sister Landi and her boys Jackson and Julius. Juju is her little guy, Jack is the teenager. They had all gotten their pics taken together when we had all of the grandkids photos taken for my mom, but you can't have too many photos! 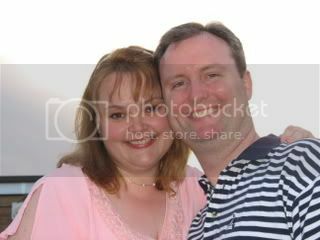 This is my cousin Melissa and her husband Kevin. Also known as the die hards from this weekend at my Nana's. They worked their rears off and they aren't even related to her! Great people. We were cracking up at Kevin's outfit. He is a manager for a big chain and at work he is all tie and white button down shirt. Here he shows up in a WB with tie and all of his tattoos in all of their glory. We loved it! He was also our bartender. I've enjoyed looking at all your prom pics. 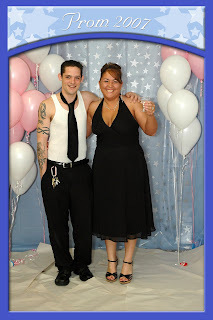 The one of your cousin's husband is so funny, tie and all!They both look liked they be the life's of the party! LOL! I'm sure it would take you all year to post all 183 pics, with Blogger. Glad you had a wonderful Mother's Day! Love all the pics...can't wait to see some candids..that is where the REAL fun is! keep 'em coming, kari! i'm up for all 183! LOL! I agree with alisonwonderland that we need to see all 183!! There are truly not enough pictures ever for me!! I love them all! Everyone looks fantastic!!! !